Expert interview: How do you catch Ebola? In this Ebola Q&A blog Brian McCloskey, director of global health for Public Health England, answers questions about how people catch Ebola. Can you start by summarising; how do you catch Ebola? Brian McCloskey: To catch Ebola you need to make direct contact with the body fluids of someone who has Ebola and is also sick and showing symptoms. When I say direct contact I mean touch. To get Ebola you would need to touch body fluids like diarrhoea, vomit or blood, then touch your own mouth, eyes or nose for instance. Ebola doesn’t spread through the air like flu or measles, it’s a virus that spreads by direct contact. It’s also important to repeat that you can only catch Ebola from a person who is ill. Before someone has symptoms there is no risk at all. Once they begin to feel ill, such as having a fever, the risk they could pass it on is still low as they don’t have much virus in their blood. Once they become very ill and start to vomit and have diarrhoea, that vomit or diarrhoea is infectious and is a risk. This is why the most common way of catching Ebola is by caring for someone who is very ill if you aren’t wearing full protective equipment. You mentioned diarrhoea, blood and vomit but what about sweat? If someone with Ebola went to the gym they might sweat a lot and touch some gym equipment? Brian McCloskey: I understand why people ask this question, but can reassure them that this isn’t a significant risk. The best way to explain why is to talk about what happens when someone gets Ebola. When you first catch Ebola you have no symptoms and are not infectious at all. As time passes the virus starts getting into the cells in your body and starts to multiply and when you reach a point where virus is released from your cells you will experience the first symptoms which are usually feeling tired and feverish. At this stage there are still low levels of virus in your body so your body fluid, like sweat, is not likely to make anyone else ill. When a patient is extremely sick – and by that I mean hospitalised and in a critical condition – there might be enough virus in sweat to infect someone else but by this stage I can assure you that the patient would not be visiting a gym and would be severely ill.
What about saliva or fluid that someone coughs or sneezes out? Is this dangerous? Brian McCloskey: Ebola is not a respiratory illness like flu that you can catch from virus particles which float in the air. That’s a really important point – don’t think of Ebola like a cold or flu as it isn’t as infectious and isn’t spread in the same way. Coughing and sneezing are not symptoms of Ebola and as I mentioned when talking about sweat, to have enough virus in saliva or a sneeze to infect someone else, you would need to be very sick and would probably be bedridden. On top of that, your sneeze would need to land directly on someone else’s mouth, eyes or nose (or an open cut in the skin) to infect them. 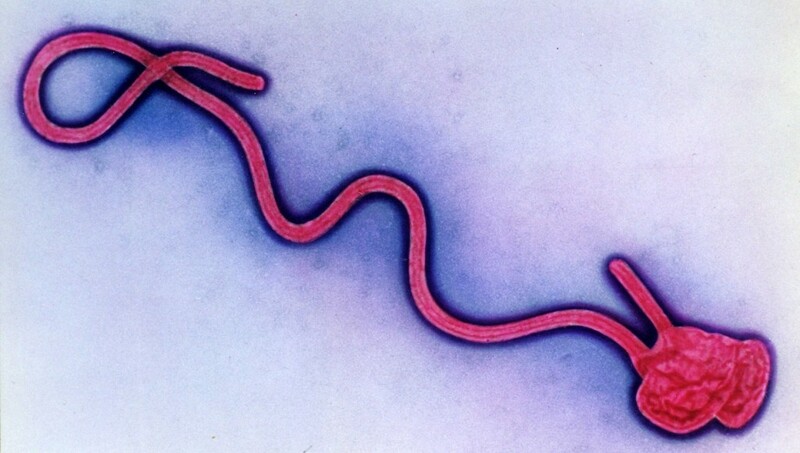 It’s also worth mentioning that the Ebola virus is quite delicate. It doesn’t survive that well outside the body. The real risk from Ebola is direct contact with body fluids like diarrhoea, vomit or blood and this is most likely if you are caring for someone who is very sick. That’s largely how it has spread from person to person in West Africa, when people look after sick patients without wearing protective equipment or through burial rites where people make contact with the body of an Ebola victim. But if Ebola is quite difficult to catch, why do medical professionals have to wear lots of protective equipment? Brian McCloskey: It’s very important that people caring for Ebola patients wear full protective equipment because the body fluids of someone very sick with Ebola are infectious. If a doctor or nurse made contact with some blood or vomit and then touched their own eyes or mouth they could catch it, so great care is taken to avoid this happening by wearing gloves, aprons, masks and eye protection. Forgive me for using a slightly graphic description but if someone is seriously ill, vomiting and suffering from diarrhoea there are a lot of body fluids in that environment and a health professional absolutely must avoid contact with them. But even at this stage there still has to be direct contact because Ebola is not airborne. Are you aware of any other rumours or myths about catching Ebola that you’d like to respond to? Brian McCloskey: The main myth is that Ebola is airborne – in other words that it could be caught by breathing in virus particles that hang in the air. Ebola is not airborne and there is no evidence that the virus will adapt to become airborne. Ebola is passed on through direct contact with the body fluids of someone who is sick, and the more unwell they are, the more infectious the body fluids are. This is why it’s highly unlikely that people can catch Ebola from normal social contact and most likely that you would catch it by caring for someone with Ebola, if strict infection control measures were not followed. If people are told that the risk of catching Ebola in the UK is low, is all the attention on this disease an overreaction? Brian McCloskey: The UK is playing a significant role in stopping Ebola at its source in West Africa, as ending this outbreak is absolutely the best way to protect the UK as well as save lives in Sierra Leone, Guinea and Liberia. Once we’ve dealt with this outbreak we have then removed the risk to the UK. Though it’s absolutely true that the risk to the UK is low, the potential impact of Ebola is high as it’s a dangerous illness. We don’t want Ebola to make an impact here and so must ensure we are prepared and this is why the Government and health services are alert to the situation. We don’t believe there will be an Ebola outbreak here in the UK precisely because of our preparation and our systems to deal with unusual infectious diseases. Domestic violence: What action are you taking? Thanks for the informative blog on Ebola. The information was really helpful in clarifying the areas and what Ebola and is not. I noted the point on evidence base too around not being air borne. Thank you and good on all the people involved in responding to this epidemic. Thoughts are with the people and their families impacted by Ebola.